And, at first, it was all very exciting. Coming from a background of covering local news for newspapers and magazines – where a ‘big’ trip would still have me home for dinner – the idea of getting paid to get on a plane and go someplace else was thrilling. I remember listening to the haggard road warriors at the gates complaining about the inconveniences of business travel and thinking they were fools. How could anyone complain about a trip to Houston or Minneapolis? How could anyone complain about traveling? It was about the time when I got my first frequent flyer medallion – 25,000 miles in less than six months – that I began to understand. Especially when I found myself going to the same places over and over again. I never really felt settled. Not local enough to know where to go that was interesting. Not new enough to be naive. It was getting tiring. Then, last June, I had to take a trip to Geneva, Switzerland for work. I had been there in May and had enjoyed it, but the idea of getting on the same plane and flying all night, catching the same connection and staying in the same hotel seemed anything but exciting. The fact that on this second trip I would be all alone made it even more daunting. My boss, who has a a lot of travel experience, recommended that I spice things up. She suggested I skip my connecting flight from Paris and spend the day exploring the city before getting on a train to Geneva later that evening. It would actually save the company money – the train ticket was cheaper than the connecting flight – and I would arrive just a couple of hours later than what I would have had I gotten on the connection. That simple move saved my travel soul and reignited a wanderlust that had become jaded by frequency and boredom. I spent 11 hours in Paris. I attended mass at the Notre Dame. I walked Hemingway’s old neighborhood. I ate the best omelette of my life. I walked nearly 22 miles, carrying my bags and nearly filling my iPhone with pictures. When, late that night, I arrived in Geneva, I was invigorated, exhausted and happy. Since then, I’ve made a conscious effort to make the most out of every business trip possible, adopting a few rules and some planning techniques to squeeze a little adventure in, whenever and wherever possible. Last weekend, I was attending a conference in Las Vegas. My flight connected via Salt Lake City and the second flight was running way late. Rather than waiting for the flight in the crowded, dismal airport, I gave up my seat (the flight was massively overbooked anyway), rented a car and drove 400 miles to my final destination. 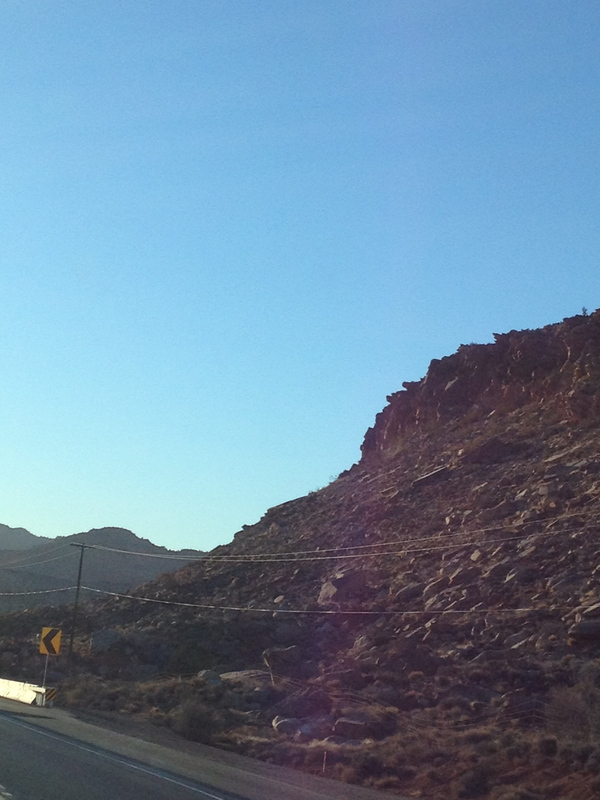 Interstate 15 descending into Arizona. It may have taken me a bit longer, but instead of staring blankly at the other frustrated travelers in the airport, I got to watch as the ash-gray Wasatch gave way to the Great Basin. I could nearly imagine buffalo herds stampeding their way down the valley. My ears began to pop outside of St. George, Utah, as Interstate 15 descended to Arizona’s Virgin River Valley and further into the southeaster expanses of Nevada. I arrived in Vegas at about the same time as my original flight took off and was a whole lot more happy for the experience. Plan for Flexibility – Direct flights are great, but if a connecting flight means a little time in a place you’ve never been and have always wanted to see, then go for it. Carry your bags on, if possible, and be prepared to go. A credit card, a loyalty card and a curious spirit can make the worst parts of business travel – delays, cancellations – an opportunity for adventure. Avoid Routine – Some people take comfort in routine. The same room in the same hotel. The same restaurant. I go to New York a lot for work and, while I enjoy staying in the same hotel, I try to never eat at the same place twice – unless, of course, that place blows my mind. Avoid Chains – If you can get something at home, what’s the point of getting it on the road? Get Social – On more than one occasion I’ve been to a new place and had no idea what to do with my time, so I reached out to Twitter and asked. You’d be surprised how good the advice is that you’ll get from friends and followers. Avoid Down Time – Nothing good ever happens in the hotel room. Chances are pretty good you’re not going to get all the work done you planned on getting done and there’s only so many movies available on demand. If you have some hours to kill, make an appointment with yourself to go see, do, eat, witness something new. Business travel can be extraordinarily lonely. Staying busy helps with the homesickness. Be Active – Hotel gyms are a little funky, but exercise has been proven to improve mood and relieve stress. I exercise more when I travel than I do at home, just to keep my mind right. Worst case – go for a walk. The world is much better seen at ground level than nearly any other way. Make an Appointment – Not a meeting, but an appointment. I try to pick one destination every trip to see before I leave. Big tours, huge lists of landmarks – they sound great, but you’re really there to work and time is an issue. Still I try to force myself to go somewhere interesting every time. For inspiration, I recommend joining the community at AFAR. The magazine is great, but the website and app help connect you to local recommendations, track all the places you’ve been and discover new places in ways most guidebooks are designed for. Be Dedicated to Enjoyment – When I first began traveling, I felt guilty every time I went on a trip, leaving my wife and kids home. And I tried talking to my wife about the tedium, but she told me – you better make the most out of the trip to make being gone worth it. Guilt and loneliness are fun killers. Don’t feel bad about enjoying yourself. It’s probably appreciated by the folks at home – otherwise, what are you doing? Why? Turn off the TV – Sure, there’s comfort in it. And who doesn’t like watching TV. But when I travel, I try to avoid it like the plague. I read. I take courses on Lynda and Code Academy and catch up on TED talks, the Walking Dead and other things I can’t find the time to do at home. And that’s only after I’ve done as much as I can outside the hotel. My DVR will catch the latest episode of Downton Abbey. No need to take the time to do it while I’m going. Just Go – There’s nothing worse than adventure regret. You had an idea the last time you were in Tulsa. You didn’t take advantage of it and now you are wondering if you’ll ever have the opportunity again. Obviously, you need to take care of your responsibilities first, but then… go. There are a few places I wished I’d gone to in my early days traveling that I may never be able to again – without taking a personal trip. Since then, I’ve become a big believer in the idea that my instinct to wander is usually correct and I try to heed it whenever I can. These are just a few ideas on how to get more out of business travel. But, like all things, I’m always looking for new ideas, thoughts and tips. Share them below or find me on Twitter @cheimbuch. I look forward to learning how you break the tedium of travel. Next Post: Post No Bills: Aren’t We Selling Soap?